Posted August 24, 2016 by Shashank Sripad & filed under Features, Tech Features. Arbin accelerates testing of production Li-ion cells with ultra-high precision equipment. Automakers are a notoriously conservative bunch. They go to great lengths to test and validate new designs before putting them into production vehicles. And, thanks to their cautious ways, today’s vehicles are more reliable than ever. Recently, however, the addition of advanced Li-ion battery packs to vehicles has presented a major challenge to the auto industry. How can they be certain new battery technology will last the life of a typical vehicle? The general rule of thumb for automotive-grade batteries is that an EV battery pack should retain about 80% of its capacity after 8 to 10 years on the road. The problem is that basic battery technology continues to advance quickly and cycle life testing is very time-consuming. 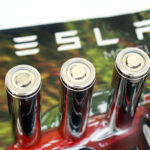 Also, for many next-generation battery chemistries – like lithium-sulfur technology or silicon-heavy anodes – the major issue holding them back from commercialization is that they lose energy storage capacity too quickly (i.e. their cycle life is not suited for EVs). As scientists attempt to find solutions to the capacity fading problems, quick and accurate cycle life testing has become critically important to the future of the industry. To perform battery testing, cells are placed in sophisticated test equipment and cycled (charged and discharged) while their degradation is continuously monitored. For use in EVs, automakers are looking for cells that will continue to perform well up to as many as 10,000 cycles. The problem is that running through thousands of cycles would take years. So the key to accelerating battery testing in a reliable way is using very accurate testing equipment. By measuring very small changes in the cell’s performance at the beginning of the cycling process, battery developers are able to extrapolate a trend line and have an idea of how the cell will behave in the longer term. It’s like an early detection system to evaluate a new electrode, electrolyte, separator material, or whatever part of the cell you’re trying to improve. The more accurate the testing equipment, the further into the future you can see. In 2012, Arbin Instruments, Ford Motor Company and Sandia National Lab set out on a multi-year ARPA-E project to develop a system that pushed the accuracy and reliability of accelerated testing to higher power levels. Three years later, the result is a new testing equipment product line that Arbin calls the Precision Series – capable of 50 PPM precision under high-power conditions of up to 200 A. “No other battery testing equipment currently on the market is capable of providing that high degree of precision at such high currents,” said Parulian. The system is built to obtain a precise measurement of an indicator called coulombic efficiency, among other characterization metrics. The primary mechanisms behind the degradation of a battery are the parasitic reactions that occur during normal use, in which a small fraction of the energy that is put into a battery is consumed in every charge-discharge cycle. For example, suppose 1,000 units of energy are put into a battery, and 999.99 units are pulled out during discharge. The small difference is used up in side reactions at the electrodes, and the coulombic efficiency is the ratio of charge output to charge input. Without a high-precision testing device it is impossible to differentiate between a battery that provides 999.999 units and one that provides 999.991, for example, but the latter would degrade faster since it is losing a larger amount of charge to parasitic reactions. With higher precision, you can develop a trend in the coulombic efficiency with fewer cycles, and then compare different cells in a shorter duration of time. And, perhaps most importantly, the confidence bounds of the forecasting data obtained from high-precision systems are much tighter, which makes the data more reliable. To eliminate measurement error, Arbin spent a lot of time on things like the design of its printed circuit boards, and minimized ripples in the control of the power supply to remove the distortion. “If you’re only testing at 100 mA, the scale of the complexity and difficulty is quite different,” said Parulian. By the end of the ARPA-E project, Arbin delivered systems capable of 200 A testing to Ford Motor Company and Sandia National Lab, which was the target current rating from the project. They also recognized that there are a lot of testing applications that will not require power quite that high, so they developed 50 A, 5 A and 1 A systems as well. Arbin is also in the process of taking what it has learned from the project and applying it to its legacy products. For more information about Arbin’s new products, download a free white paper here. This article originally appeared in Charged Issue 26 – July/August 2016. – Subscribe now. I still continue to assume that the USA for example, has spare electricity generating capacity to feed EV,s on mass, with electricity in place of fossil fuels. Do I assume the electricity is produced by fossil fuel but not in the varied city environments. Is the plan to power all these 500,000 +++ vehicles by renewables? From on roof solars leaving the question on powering the EV,s still my question. In Europe we have a great reliance on Russian oil and gas??? Little spare capacity unless we go nuclear?? Germany has banned nuclear and most banned fracking. Well Robert, I am an Electrical Engineer that has been around awhile and I am watching this way in which we (the world’s people), react to change. Seems that all of the original estimates of how many electric vehicles would be on the road by 2020 has been greatly under estimated. Since I have been associated with the electrical world from data center applications to Hydro power plants, I too have this question? Are we just moving the carbon foot print from the roads and highways to a central point called a power generation plant, and which is better for the world? I went back to work after a so called semi-retirement with a electronic manufacturing company for the purpose of furthering my education on such questions. We worked hard on this matter in which you are questioning. We found that what could really happen, and this is quoted by some much more noteable than I, that by 2040, ten percent of the worlds available power will be used to charge up electrical vehicles of all types. With that in mind , we have come up with a method to slow down the attack on the grid by using the power at a more regulated basis. Its all about control and timing. We have a solution to slow down the amount of power needed at any one point in time there by cutting the impact on the grid, for the charging stations controlled by our equipment ; by 75%. Demand is what we need to control. So in partial answer to your question, this is a world wide problem, and the US is not going to answer the Demand at its present rate. Everything helps , such as solar, wind, hydro, and thermo, but when the time comes, it will be based on availability, time and control. Frank Podesta – Cyber Switching Solutions, Inc. Thanks Frank, the most sensible answer I have recieved. If only governments would sponsor more development into wave and tide power, rather than nuclear, the obvious gap in the 2020s could be closed. Tide and wave is the answer if you look at the maths . The U.K. will have a much harder time switching to renewable energy than the United States. It is densely populated – and the Achilles heel of renewable is that it is very low density compare to fossil fuels, and even more so compare to nuclear. I recommend David MacKey’s now slightly old, but excellent and free book: Sustainable Energy Without the Hot Air. Google and you will find it both online in HTML format (that is, as web pages) and downloadable as a PDF document. The book gives lots of back-of-envelope ballpark estimates of how much energy the UK could plausibly get from different renewable sources. Electric cars are important for many reasons. First, they are much more efficient than fossil-fueled cars. If you were to burn gasoline and diesel to make electricity (nobody does this!) you’d still be a bit better off with EVs than ICEVs. But with a mix of sun, wind, nuclear and natural gas it can be a LOT better – though how much of course depends on the mix. Second, centralizing emissions in areas where few people live is an important benefit not to be scoffed at. Regardless of where, having relatively few central emitters also makes it easier to improve emissions over time – potentially we might capture some of it. Or find new sources to be used. If people buy an ICEV it’ll be less and less green over its entire life of 15-20 years. If they buy an EV, it can get greener as the energy mix does. Third, EVs will, as cars go out of circulation due to crashes, old age, water damage and so on, provide at first just a trickle, but eventually a stream of batteries than can be used to as buffering in homes or in the grid. Energy storage is key to enabling a high proportion of most renewables since they tend to be intermittent (hydro is an exception, but few countries have significant hydropower potential). Personally I think next-generation nuclear makes sense. If you look companies like Bill Gates’ Terrapower, it certainly looks promising. Their reactor not only features passive safety not reliant on human operators to never make mistakes (such as at Chernobyl), but they take as input the radioactive waste we have already produced and otherwise must store securely at huge expense. They provide huge amounts of power and leave us with much LESS waste than if we don’t use them (TerraPower claims to reduce the waste by 99%). And of course, they are CO2 free. Given the urgency of cutting emissions I think it makes a lot of sense to employ this technology for a few decades while we add buffering to the grid and get ready to rely primarily on sun (PV) and wind. Rob, Thank you and just a note to the wave generator. I believe China have a wave generator a few years back around 2000. I was following it and they ended up taking it out. They claimed the reason is that they determined that enough of these would slow down the earth’s revolutions. Hard to believe, did not try to figure that one out. Its like it makes sense, but is it real. In that I remember the average USA person uses 75,000 KWhr of energy per year. That includes everything from gas to heat to food. Sadly the percentage of the 75,000 was high due to gas content. The use of EV whatever electrical base just moves the content from fossil to another located fuel or energy source . As I said before it would appear that only sea power offers the answer or with maybe space based generation. It’s the 75,000KWhr that one should remember as the population rises from 7 billion towards 9.5 billion in short time. I,m not optimistic ! Sad if not. Oh! I spent years in lithium batteries, mostly primaries but it’s fun to note that nickel is the growing lithium battery content in secondaries. Our company was the largest world nickel cadmium producer.